Do you desire a personal connection with God, but have genuine questions, doubts, and concerns? In It's Personal, Andy Stanley makes a case for the fact that adults don't become followers of Christ by getting all their questions answered. In most instances, something happens that shrinks those questions. And that something is always personal. You don't have to understand everything to believe in something. 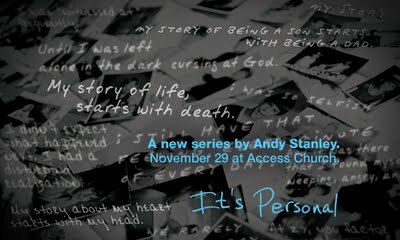 Join us for the kick-off of this four-part series November 29, 10:30am, at Access Church.